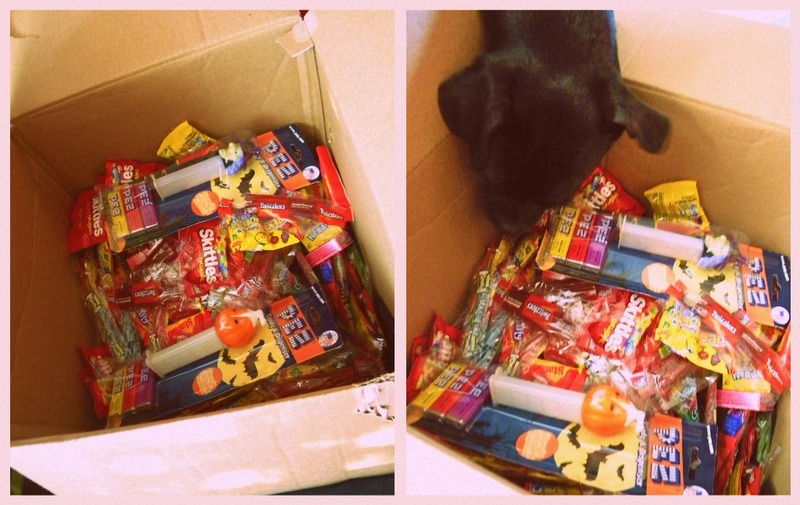 To start our Halloween off right, Grandpa and Gram sent one of their magical boxes to the kids from Chicago. As always, the squealing began before the box was opened. And then we saw what was inside and a hush fell over all of us....Chris and I for a different reason than the children. We were in shock. Horrified, shock. The children were also shocked. Amazed, shocked. See the difference? It was a box of candy. I repeat, a BOX of CANDY. Ike was also shocked at the box of candy. And he desperately wanted to sample a few pieces. 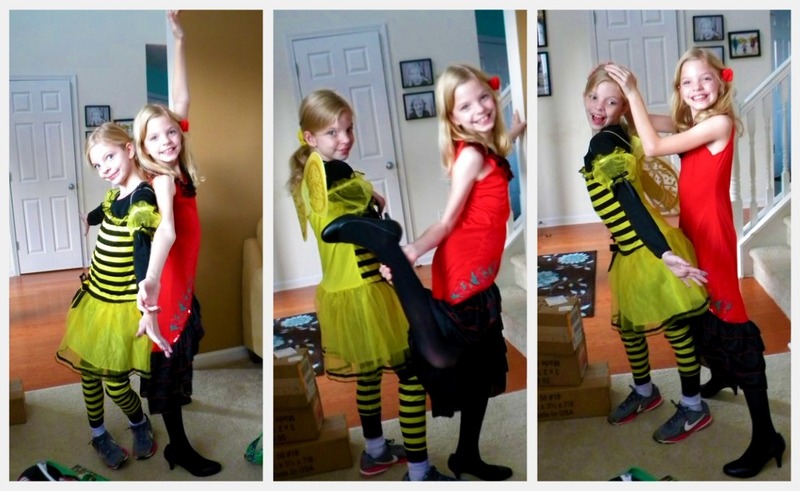 The girls were a bumble bee and a senorita flamenco dancer. Chandler chooses her costumes solely on the shoes she might be able to wear with it. Casey based her decision on the use of wings. They're starting to be really awkward, aren't they? I love awkward middle schoolers and that is definitely the direction in which they are heading. They also have really long arms, don't they? Drew, CB and Loralai came over for dinner and then we headed out. CB and tried to take a few pics of Q and L before leaving. I clearly get an F on the assignment. They just wouldn't stop moving. At the first house we went to they gave out candy AND glow in the dark bracelets. Quinn was confused by this. I don't blame him. He wasn't prepared for a bracelet. On our way up their driveway he kept saying, "I have to ding their door!" And, of course, I just love the pictures of Quinn holding Chris's hand. And then CB and I bid farewell to the men and the children and headed home to answer the door. 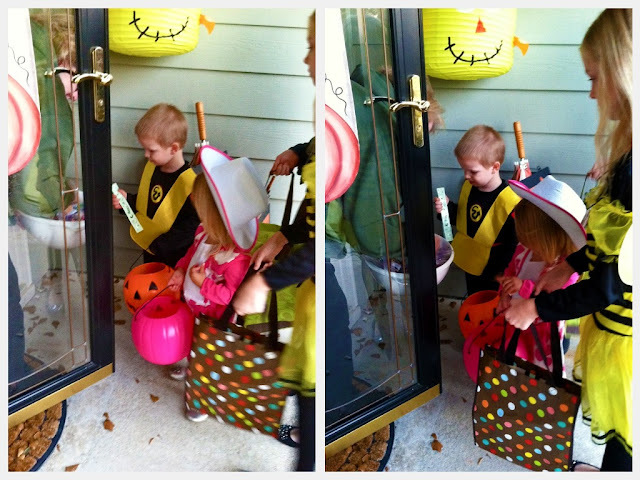 Oh, I soo love this post each year and the pictures of the kids in their costumes. Perhaps one year I can come over for Halloween. I'm really surprised by the girl's choices in costumes. I would have thought Cas would go for the Flamenco dancer and Chan the Bee. But I love that Chan chooses her costume based on the shoes. That is what I call Solid Decision Making. And Quinn... that little cutie pie. Is he a Ninja? Please tell him Aunt Molly thinks that is an excellent costume. Hope you all had fun. Miss you!! I said a bad word as soon as I saw that giant box o' candy. Holy moly! Looks like y'all had fun and I love Quinn's video! I understood every word. 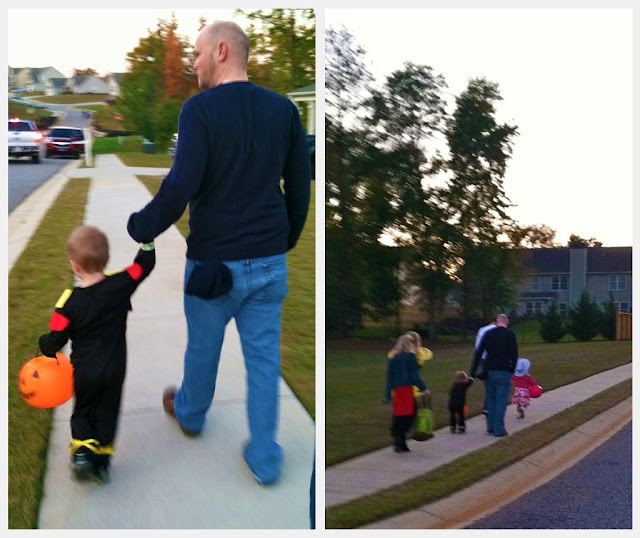 :) Jonah asked if Quinn was trick or treating tonight. I assured him that he was and that he would get candy too. So cute. I miss trick-or-treating.